New York Forum Africa 2013: The ICC, judicial colonialism in Africa? 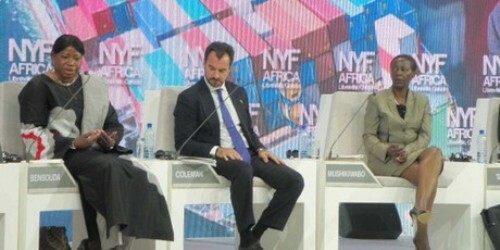 At a debate on "independence" in Africa during the second edition of the New York Forum Africa 2013 in Libreville, Gabon, the Rwandan minister for foreign affairs, Louise Mushikiwabo, called into question the role of the International Criminal Court. The chief prosecutor of the ICC, Fatou Bensouda, tried to defend the judicial institution that she directs. "The International Criminal Court was created by the international community that is not under the leadership of the great powers," declared Fatou Bensouda, chief prosecutor of the ICC, at the debate on the theme of "The road to a new independence" during the New York Forum Africa 2013 in Libreville, Gabon. The event, founded and directed by Richard Attias, brought together at least 1,500 participants for this, its second session, according to the organisers. At the debate, the Rwandan minister for foreign affairs, Louise Mushikiwabo, accused the directors of the ICC of being a judicial organisation created specially to carry out justice against African leaders and political figures. "It is not honest to say that the ICC is not stacked up against Africa. I don’t agree with my sister Fatou Bensouda," said the Rwandan chief diplomat. "A large number of Africans believe strongly in this ICC but it is a real problem today." A problem which, according to her, comes directly from Europe. She accuses the Europeans of using "this ICC" to manipulate African politics. She regrets that the ICC "limits" its field of action in Africa and asserts that outside the African countries that have themselves called on the ICC only two countries on the continent have been directly targeted by the ICC, Sudan being one. Fatou Bensouda took the floor after applause for Mushikiwabo: "It’s unfortunate that a large number of verdicts have been reduced to political manipulation." According to the chief prosecutor, African leaders in Mali, Côte d’Ivoire and the Democratic Republic of Congo had called on the ICC to intervene in their countries. "With all due respect for the previous speaker [Louise Mushikiwabo], we know that Africa pushed for the creation of the ICC!" she declared, before recalling that "the first country to have ratified the treaty of Rome was an African country – Senegal." Mushikiwabo did not lower her guard, retorting angrily: "Don’t tell me that Africans come to you [the ICC] to be judged. That’s false because Africa does not want judicial colonialism!" Bensouda, in turn, denied that the ICC was exercising judicial colonialism in Africa. Politicians and representatives of civil society in Africa accuse the West of creating the ICC with the sole aim of hunting down Africa’s black sheep. Fatou Bensouda, on the other hand, insists that the ICC has opened files in other countries outside the African continent. Yes, but how many compared to the numerous judicial files opened by the ICC in Africa?